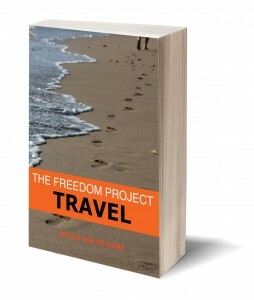 In his book The Freedom Project (ISBN 978-0993826009), Wilko van de Kamp explains for the first time, the secrets of travel he has used to explore the world, and fly for free. The book shows the zen approach to travel and how to use travel as a lifestyle to fulfill dreams and goals. The book is not just about travelling, but about life in general. The Freedom Project is dedicated to inspire people to go explore the world. After relocating to Canada at age 26, Wilko spent most of his life savings on moving his belongings across the Atlantic Ocean. The only way to maintain a busy travel schedule was to find a way to eliminate one of the most expensive components of travel: getting there. He did so successfully and explored over 18 countries in Europe, Asia, North and South America. How to escape, and deal with what gets in the way of getting away. How to plan for travel, turning dreams into goals, and plans into action. How to book travel and claim what’s yours. How to prepare to leave, and find the purpose of being packed and ready to go. How to go to where you want to be, bridging the distance while still feeling connected. How to be at the destination, and live your traveling life feeling more alive. How to come home and take some of your traveling “self” to who you are at home. The Freedom Project is available through finer book retailers worldwide, including Amazon or directly through FreedomProjectBook.com. Be the first to know and join our growing community of like-minded individuals and claim your free subscription to our weekly magazine Living by Experience. Copyright © 2013-2019 WindmillGroup.biz. All rights reserved.